We're almost through. I think. She still has the little sores all over, but they've faded, and her mood has improved--no more catatonia, no more whimpering over a bad taste in her mouth. She's napping and and going to bed like a champ, though, which has me concerned that maybe this is life-threatening. 2 1/2 hour naps? My child? Something must be horribly wrong! Since I have nothing to report beyond extreme cabin fever (which got so bad that we went so far as to set up a tent in the living room, so as to give the feeling of being out in the woods. A little Fleet Foxes, some pistachios, and a strong fan and you can almost feel like you're outside. Almost) I'm going to leave you with totally unrelated photographs of some more knitting. (Unless, you know, you want photographic evidence of the Coxsackie Sores). This is the Sophie Blouse, pattern soon to be found in What To Knit When You're Expecting. This particular version is knit for 2T--which will not be available in the book, I'm afraid, but don't be sad since the sizing needs a bit of tweaking. 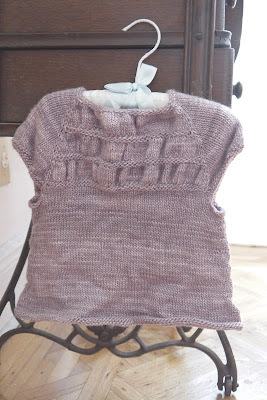 The shoulders and body were a little large for Willow back when she turned two...I haven't tried it on her recently because of the problems with wool and extreme heat and humidity. The pattern calls for Punta Del Este Mericash (because I believe no yarn is too good for a baby) but this sweater is knit with Malabrigo Silky Merino--also very nice and fancy, but slightly bulkier to make it easier to size up (again, not so sure how that worked out for me on this one--I'd definitely need to experiment before being willing to share). I'm very proud of the back. It is, honestly, a fun knit--the gathering of the ruching, plus the trickiness of trying to maintain the raglan made it a little bit maddening to design, but it was one of my first patterns for the book and I love coming back to it. Looking at it, I think it will fit Willow this Fall, making it a 3T, maybe? She's growing so fast. So look back here for more pictures come October. The Sophie Blouse is beautiful! i found your blog through a promtoe your blog post. i would love for you to visit my blog and follow if you like it.